Highroof Fest. Justin, Mike and Dean caravanned from Sacramento to share their rare Highroof Panels with all of us, thank you! Barndoor Lineup. 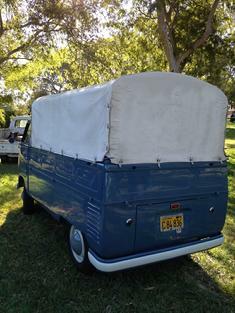 Mark's 1953 Deluxe, Todd's Single Cab, Jeremy's 1953 Microbus, Todd's Panel and Eric's 1954 Deluxe. Bus Fest 10's special display was Highrooof Panel buses. Justin, Mike and Dean came to the event via Highroof/Barndoor caravan from Sacramento, thanks to Dean for rounding up the Highroofs. As with each Bus Fest, there were buses from Barndoors to Eurovans, the barndoors this year were Mark's 1953 body-bumpered Deluxe, Todd's Single Cab and Panel, Eric's 1954 Deluxe and Jeremy's 1953 Microbus - quite a lineup. Making their Bus Fest debuts this year were Pete's immaculate 1956 Single Cab and Eric's 1961 German pop-up trailer, towed behind his 1961 Westfalia. Derek Gregg won the long distance award by driving his pressed-bumper Panel all the way from So Cal. Parking duties were handled by Scott, Brent and a group of volunteers from the Old Volks Club, thank you all for your help. This year's end-of-the-day raffle was the best yet, thanks to our uber-generous sponsors and donors! Besides an amazing array of Type II goodies from Greg's VW Service, Wolfsburg West, Vintage Parts Inc, Lavere's, Nor-Cal Relics, Vintage Wheels and Deluxe Jerry, there were two grand prizes - safari windows from Honest Engine Midtown and a rebuit transmission from Kombi Haus! Thank you, thank you, thank you to our amazing sponsors who donate amazing prizes every year and continue to show up and support the event.